Anticipating large-scale molecular dynamics simulations (MD) in nano-fluidics, we conduct performance and scalability studies of an optimized version of the code ls1 mardyn. We present our implementation requiring only 32 Bytes per molecule, which allows us to run the, to our knowledge, largest MD simulation to date. Our optimizations tailored to the Intel Sandy Bridge processor are explained, including vectorization as well as shared-memory parallelization to make use of Hyperthreading. 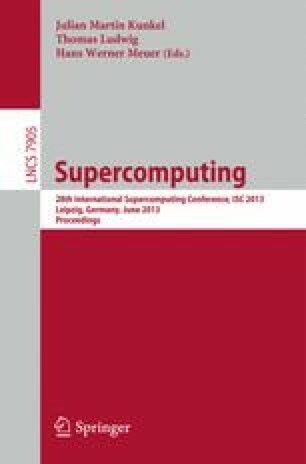 Finally we present results for weak and strong scaling experiments on up to 146016 Cores of SuperMUC at the Leibniz Supercomputing Centre, achieving a speed-up of 133k times which corresponds to an absolute performance of 591.2 TFLOPS.